It was made plain on April 7, 2008, by the Democratic leader of the New York state Assembly, Sheldon Silver, that the congestion pricing proposal in New York City would not even come to a vote in the state capitol in Albany. Just a year earlier, on Earth Day, New York City Mayor Michael Bloomberg first proposed the congestion pricing plan as a way to both reduce traffic in Manhattan’s streets and increase funds for mass transit throughout the City’s five boroughs. Due to car emissions, driving both adversely affects the environment and the health of communities. Consequently, it should be taxed similar to increased taxes on tobacco and liquor – people will drive less and mass transit will have better investment. Driving may be harmful, but it is still not a vice like tobacco or liquor. Rather, driving is a need and a right. The cost is already high, and it is taxed enough. And, simply, the alternatives to driving are not yet an adequate substitute. Some major cities around the world, including Singapore, London and Stockholm, have been able to remedy this divide and implement congestion pricing plans. Still, though cities in America have proposed it, nowhere in the country has congestion pricing been realized. Since its failure in New York, San Francisco is now considering a similar plan. As a part of the PlaNYC initiative put forward by Mayor Bloomberg to make New York a greener city as it continues to develop over the next few decades, the initial congestion pricing plan announced in April 2007 proposed an $8 fee to passenger vehicles entering Manhattan below 86th Street between 6 am and 6 pm on weekdays, and $4 for trips within that zone. By implementing congestion pricing, $354 million in grants through the federal Urban Partnership Agreement would have been allocated to the City for mass transit improvements. Also referred to as the Central Business District, the part of Manhattan below 86th Street on a given day has some 2 million workers from around the region, hundreds of thousands of tourists, and several hundred thousand residents. With these people come cars. And, if it had been implemented, traffic within the congestion pricing zone was projected to decrease 6.3 percent and speeds were projected to increase 7.2 percent. Still, in January of the following year, changes were made to the Mayor’s proposal – namely, reducing the congestion pricing zone to below 60th Street instead of 86th. The opposition to the plan came mainly from the outer boroughs and the surrounding suburbs – where the drivers lived. But, that opposition was minimal. According to a March 2008 Quinnipiac poll, the overall public support for congestion pricing in the City, if the proceeds were used to improve mass transit, was 60 percent to 30 percent statewide. New York City voters supported the plan, if the money was used for mass transit, 67 percent to 27 percent, while suburban voters supported it 51 percent to 43 percent. Despite the city and statewide public support, the New York City Council, which votes unanimously on most issues, voted only 30 to 20 in support of the plan on March 31, 2008. The deadline to apply for the federal Urban Partnership Agreement funds – $354 million for mass transit – was on April 7th. In the end, no vote was made by the New York State legislature. Mayor Bloomberg’s plan to implement congestion pricing failed as time ran out. The winners: Politicians from Queens, Brooklyn and New York’s suburbs, who maintained that congestion pricing was a fee on commuters to the benefit of well-to-do Manhattanites. 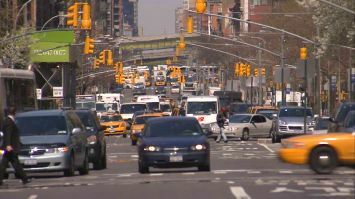 Specifically, New York State Assembly Speaker Sheldon Silver, representing the Lower East Side of Manhattan, opposed the plan arguing motorists would avoid congestion pricing fees by parking in neighborhoods just outside the zone. As a result, neighborhoods would become “parking lots.” Also, Assemblyman Richard Brodsky of Westchester County issued a report on the proposal, calling it a “regressive tax” on the poor and middle class of the region. Still, though New York City lost federal funds for its transportation system as a result of the plan’s defeat, U.S. Secretary of Transportation Ray LaHood recently made it clear that the funds are still available if the city is ever able to implement congestion pricing in the near future. Singapore was the first country in the world to implement Electronic Road Pricing (called congestion pricing in the U.S.). The following is a Worldfocus–Blueprint America report on Singapore’s successes in alleviating congestion, while, at the same time, the automatic fees take a toll on Singapore’s commuters. Worldfocus producers Mary Lockhart and Ara Ayer, and correspondent Daljit Dhaliwal report; this segment was part of a series on infrastructure produced by Worldfocus.